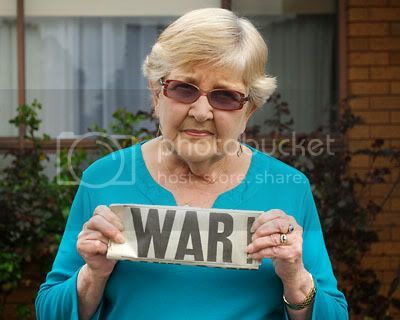 Australian age pensioners are as mad as hell and they’re not going to take it anymore. Pensioner activist Shirley Grant, 72, of Glenroy, Victoria is leading the grey power charge and wants a fair increase to the age pension. In recent weeks, Federal Treasurer Wayne Swan and Deputy Leader Julia Gillard have conceded they couldn’t live on the age pension. Prime Minister Kevin Rudd has said that age pensioners are finding it difficult. Yet they seem slow to act in addressing the situation and the pensioners are gathering a head of steam. Mrs Grant, along with Family First senator Steve Fielding, organised the fair go for pensioners protest that was held on 16 May 2008 at the intersection of Flinders and Swanston Streets in Melbourne. During the 200 strong protest, a woman stripped down to her 10-year-old bra, a man stripped to his jocks, and Senator Fielding bared his slim torso in support of the pensioners. Mrs Grant is a mild-mannered articulate lady who is up for the battle. She lives in a humble suburban unit with husband Vince, and they say they’re fighting the fight for the pensioners of today and tomorrow. Central Tilba, population 100, is an historic village located on the Eurobodalla Coast in New South Wales, Australia. The town is classified by the National Trust and is primarily relient on tourism. The imposing Dromedary Hotel provides good pub meals and is an ideal stopping point for a beverage. There's old-style accommodation at the hotel, the Two Storey Bed & Breakfast, as well as a few other B&Bs in the village. The ABC Cheese Factory is a must-do with free samples of cheese and honey available. Ice-cream is also one of their specialties. The Woodturning Gallery has excellent small carved works which make ideal gifts, with more expensive items such as dining furniture, large tables and leadlight lamps also on display. I have a collection of photographs featuring Central Tilba which are for sale here , and the 2009 Central Tilba Calendar can be previewed and purchased here . Here's a short slideshow of Central Tilba to enjoy. I'm pleased to announce my 2009 range of Australiana themed calendars are now available to purchase via my online sales agent, RedBubble. There's 12 different calendars in the collection to date which depict various aspects of Australia. You're most welcome to browse through the collection, and if you'd like to provide feedback, that will be great. 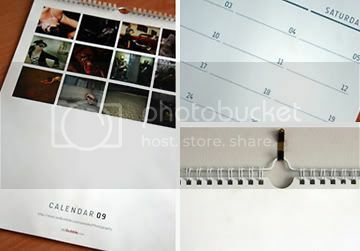 Calendars are an ideal gift for giving to family and friends, and yourself. Here's the full list for viewing. Each thumbnail is clickable and it will direct you to a full preview of the calendar and unit pricing. Before the internet, what did people do to waste time? Make babies and talk to one another? Television remains an excellent education medium, with news, current affairs and documentary programs capable of informing in a manner which is seemingly still better than the internet. Of course some may disagree, but I find it difficult to comprehend how television may have slipped to a point where it’s not the No. 1 source for news. Let’s say there’s a terrorist attack, a commencement of war or some other attention grabbing event. Where would you go to see the footage and be informed as to what’s going on? This is where television, in my mind, is superior to the internet. So what does the future hold for television, say in 10-20 years from now? Are big media companies going to shift dramatically to the web, or still maintain a news presence? I suspect television will be around and will continue to distract people from the internet. Ted Egan takes viewers on a visual and story telling journey for 50 minutes in his This Land Australia program, The Snowy Mountains. Filmed over four seasons, Egan narrates the production that features stories from people who worked as stockmen in the high country, workers who built the Snowy Mountain Hydro Electric scheme and how a young girl gets to school each day on a skidoo. There’s historic film of the Snowy scheme being built, and a visit to the scheme by the Queen. Egan shows the highest point in Australia, Mt Kosciuszko (2228m) which was named after Tadeusz Kosciuszko by Polish-born explorer Paul Strzelecki in 1840. Also shown is a statue of Strzelecki, located on the shore of the man-made lake at Jindabyne, which is part of the Snowy Mountains Hydro-Electric Scheme. There is footage of the Skitube, which runs between the ski resorts of Perisher and Mount Blue Cow, and of people enjoying the outdoor and indoor snow-related activities at Thredbo. Ted Egan AM was born in the Melbourne suburb of Coburg on 6 July, 1932, and moved to the Northern Territory in 1949 at age 16. Egan is an Australian folk musician and author. He is featured in the Hands of Fame at the Tamworth Australian Country Music Centre in Tamworth, New South Wales. Ted Egan’s This Land Australia – The Snowy Mountains can be purchased as a DVD from Australiana Online. Shopping for well-known clothing brands at discounted prices can be experienced at DFO Essendon. This large shopping complex, which includes a Homemaker Hub, is located at 100 Bulla Road, Strathmore, VIC, adjacent to the Tullamarine Freeway next to Essendon Airport. For men and women, brand names such as; R.M. Williams, Rivers, Polo Ralph Lauren, Colorado and Country Road are just a few retailers who offer heavily discounted prices on firsts and seconds clothing items. A large foodcourt provides the ideal opportunity to rest weary legs after a few hours shopping, with Subway and the Coffee Club providing healthy food and beverages. One of my favourite photographs has been selected and published in Camera magazine by its Editor, Paul Burrows. 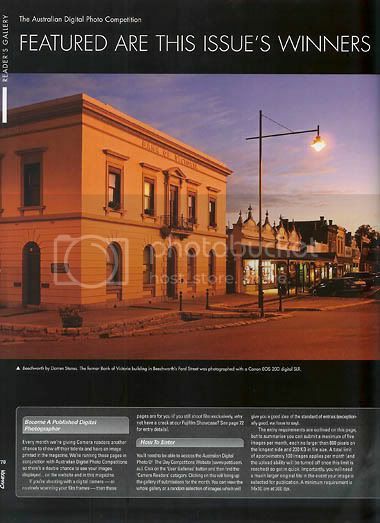 Beechworth features on page 70 of the Sept/Oct '08 edition. The photograph was chosen by Paul from a pool of 100+ photographs submitted to the Australian Digital Photo Of the Day Camera Readers Gallery. 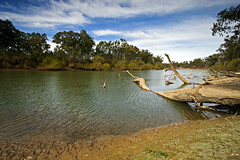 Beechworth is available for purchase online as various products in my gallery at RedBubble, and is also available for licensing. 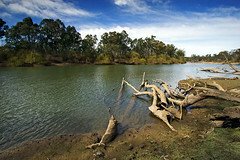 contact me if you wish to license Beechworth to help promote your products and services. The building featured in the photograph is the former Bank of Victoria at the intersection of Ford and Camp Streets, Beechworth, Victoria, Australia. 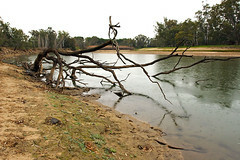 Drove to Corowa, NSW, Australia and spent the last weekend in August '08 there to check out the water level of the Murray River. It's not really a river at the moment - more like a shallow stream you could wade across. 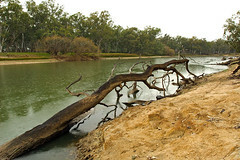 Official data from the New South Wales Government NSW Water Information website indicates that the water level at Corowa on September 30, 2007 was 1.2 metres. 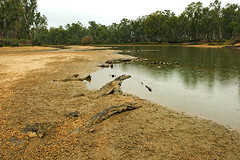 The water level recorded on August 30, 2008 was 0.35 metres. 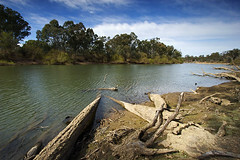 The height of the river fluctuates during the year according to rainfall and discharge from Hume Dam, and during December '07 at Corowa it was recorded at 2.3 metres.